This product was added to our database on Friday 21 October 2016. Gerry Beck, an enthusiastic warbird pilot and restorer, built a P-51A Mustang at his Tri-State Aviation workshops in North Dakota. Reports vary whether this was entirely built from scratch or included some salvaged parts, but when the project was finally rolled out in 2006 it was a stunning achievement. The aircraft differed from a standard P-51A by having a second seat fitted where the radio bay was originally fitted and having the armament and gun camera omitted. The aircraft was painted in the same colours as the famous Reno Racer “Precious Metal” for filming the movie “Thunder over Reno” and somewhat confusingly known as “Precious Metal II”. It flew at EAA Airventure in July 2007 and participated in a mock air race with other warbirds. Tragically, Beck touched down behind a P-51D “Dazzling Donna” piloted by Casey Odegaard. As they landed, the P-51A’s propellor struck the tail of the P-51D. “Precious Metal” flipped and crashed, killing Beck. Beck’s legacy lives on through his family’s support of the Fargo Air Museum in North Dakota. The remains of “Precious Metal” were salvaged and may yet return to flight. 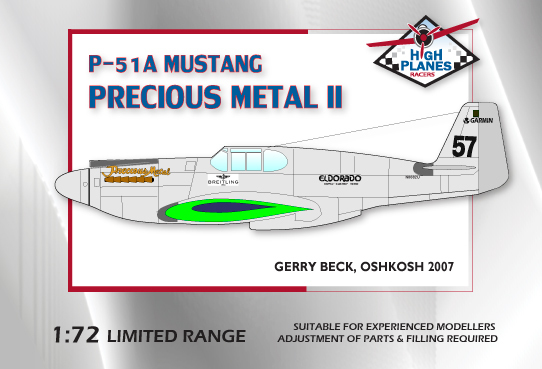 The High Planes Models kit includes limited run injection moulded plastic, Falcon vacformed canopies, white metal parts, resin parts for the passenger modifications and decals for Precious Metal II at Oshkosh in 2007..